Spring, summer, and fall months are ideal for motorcycle riding. But the increased heat causes a dilemma for some bikers – what should you wear? You will want to maximize your safety while adjusting your clothing to stay cooler. Rather than just foregoing your safety equipment in order to stay cool, try adjusting the gear that you use. In the event of a crash you will still be protected. Open faced helmets are one way to stay cool while staying safe. Open faced helmets help to keep your head cool because they allow more air to flow to your body and and face, which will keep your head much cooler. Open faced helmets will still do a great job protecting your head in the event of an impact, but they will not protect your face. There are several different types of open faced helmets. There are flip-up helmets, modular helmets, and crossover helmets. You should try each to find the right one for you. 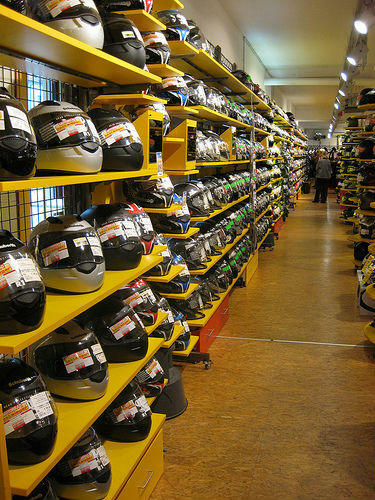 Helmets are not the only type of protection that motorcyclists should invest in. Shorts are not an option, as they offer absolutely no protection. Similarly, jeans may be comfortable but are not strong enough to protect your legs if you are involved in a motorcycle accident. However, motorcyclists can buy motorcycle jeans that offer good ventilation and good protection. They will use materials like Kevlar for added body protection. Any motorcyclist should invest in this protective gear if you plan to be spending time out on the roads during summer months. Though these can be used at any time of the year. They come in other materials as well other than denim, if you prefer to not wear jeans. Motorcycle jackets do more than just make riders look cool. They offer a significant amount of protection. Leather jackets are one of the top choices, and while in the past these jackets could be unbearably hot, now motorcyclists have more options. Like the motorcycle jeans, jackets are pretty well ventilated. Still, leather jackets will be warmer than jackets made from other materials, so you should try a few out if you are ultimately looking to stay cool. Try jackets that have a lot of vents. This way, as you ride and you get warmer and warmer, you can open more vents to keep from overheating. Jackets with vents are more versatile, as you can close the vents then if the day is colder or at night and in the evening when you would prefer to stay warmer. Whatever jacket you choose you should make sure that it is abrasion proof. Make sure to check out all of our options when you go shopping for gear instead of just going without. The safer and more protected you feel, the less you have to worry about. Even when you do everything you can to stay safe, accidents are still a possibility. If you are injured in a motorcycle accident you should contact a Missouri motorcycle accident attorney as soon as possible. To schedule a free consultation with a St. Louis Motorcycle Accident Lawyer, call The Hoffmann Law Firm, L.L.C. at (314) 361-4242 or fill out our online contact form.